A Walk in Their Shoes is a collaborative effort by north central Wisconsin educators who hope to put a very personal face on the current events that fill the airwaves, print media, and the Internet. By providing access to powerful speakers who have first-hand experience with contemporary history we hope to provide middle school students across central Wisconsin with lessons that impact students’ lives, helping them see the world with different eyes, the opportunity to look at life from a global perspective, and the chance to see that one person can truly make a difference. students and community members of central Wisconsin. Our first presenter was Immaculée Illibagiza, author of Left to Tell, and Rwandan genocide survivor. 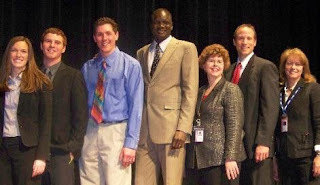 In spring 2009, A Walk in Their Shoes welcomed John Bul Dau, one of the Lost Boys of Sudan, author of God Grew Tired of Us. 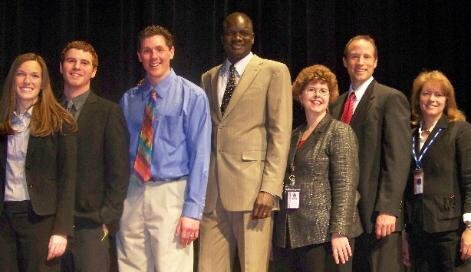 Each of these speakers have delivered incredible presentations of the power of the human spirit and the importance of involvement as part of the global community.Presentations are held in the Auditorium at Wausau East High School. Two student presentations of 1 hour, 15 minutes are held. The presentation consists of 50 to 60 minutes of presentation and 15 to 25 minutes of Questions and Answers. Questions are all crafted by students as part of their classroom study prior to their attendance at the student presentations. One is scheduled for the morning and one for early afternoon. This accommodates approximately 1,700 middle school students (public and parochial) from across the county. A luncheon with key organizers and supporters is held at the school between the student presentations. largest district in the county—boasts students who speak over 35 different home languages. •Better equip the children of central Wisconsin to live and thrive in a global society. single individual can make on the world. •Provide context and relevance for classroom instruction of social and cultural studies. presentation brought to the community by A Walk in Their Shoes.